HA NOI (VNS) — People living in apartment buildings of the capital's new urban areas are expressing concern over poor-quality tap water. Tran Van Xuat, a resident of Spark Duong Noi new urban area in Ha Dong District said: "I often find tap water containing sludge." When the water was boiled, the sludge turned yellow, said Xuat. A resident of 15T1 apartment building in Hai Ba Trung District, Vu Tien Suu said his tap water was full of dirt. "And this is not the first time," he said. The apartment building's management board had carried out numerous efforts to clean the water tank, but dirty water had reappeared several months later, he said. Nguyen Van Thuy, who lives in the Xa La apartment building, said residents had become worried about test results showing 2.5 times the legal limit of arsenic. Some households had to buy water from other places or bottled water to use. "Our health is dependent on clean water," said Pham Thi Hoach, who lives in the My Dinh 2 urban area. "When we found out the tap water we were using contained arsenic, we were in shock," she said. Residents were being charged extra for the tap water and therefore expected it to be clean, she said, adding that the city should fix the problem as soon as possible. The Ha Noi Construction Department said there were two steps involved in providing tap water to people living in apartment buildings. First, tap water was taken from the water treatment factory to the apartment building's water tank via a water pipe. Afterwards, the water was transferred from the tank to households via a water pipe system inside the building. 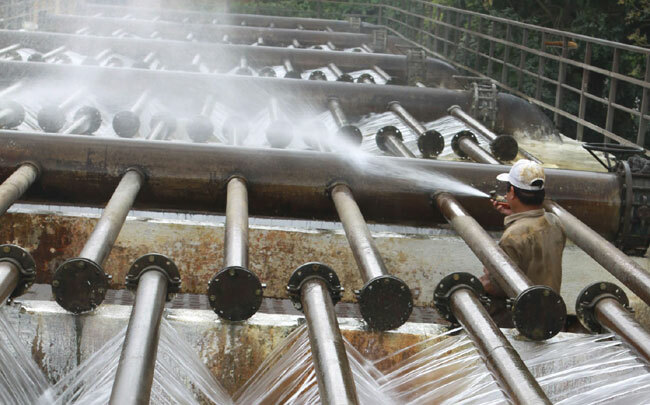 The Ha Noi Water Limited Company said the tap water's quality was routinely checked to ensure it met standards issued by the Ministry of Health. Poor quality water tanks or substandard pipe systems inside the buildings were possible causes, the company said. The Ha Dong Water Supply Company said it had taken samples for tests after receiving recent complaints from people living in Xa La apartment building about the level of arsenic found in the water. Vice Chairman of the capital People's Committee Nguyen Quoc Hung said that the committee had also issued a directive to authorised agencies to fix the situation. Meanwhile, a survey, conducted by the Ministry of Health and released late August, showed that HCM City was failing to provide tap water to all residents, Lao Dong (Labour) newspaper reported. Substandard quality tap water was still being found, the survey said. Respondents indicated that tap water was not meeting standards at three major water supply factories in Thu Duc, Binh Chanh and Phong Phu. Manganese and iron concentrations in the water were higher than the legal limit, posing a threat to those using it.